Ashley Watson is a London-based menswear designer, engineering functional clothing for the road and partnering with specialist factories across the UK and Europe. Piece by piece, he is building a collection of purposeful clothing that’s hardwearing, reliable and essential to any trip – be it a short run across town or weeks spent on the road. Last year he came across some old family pictures and medals won by his Great Granddad. Unbeknown to Ashley until that moment, in 1911 his Great Granddad had travelled from London to Edinburgh on a motorcycle as part of the Motor Cycling Club. This sparked an idea into Ashley’s mind: he wanted to honour his Great Granddad by going on a month long trip around Europe, alone, on a motorbike custom made specifically for the journey. 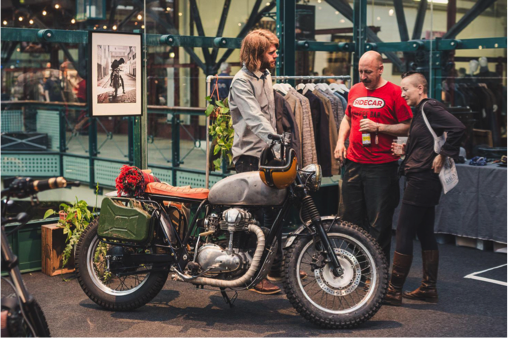 The motorbike is made up of different parts, such as the tank from 1960’s Triumph T120r, Speedometer from 30’s Morgan, ex military Pannier Racks and Lucas King of the Road Headlight. Safe to say, you won’t find another one like it. Whilst honouring his Great Granddad and keeping in check with a heritage theme, Ashley wanted to collaborate with brands who also had their own family history, which is where MOSCOT come in. MOSCOT started a little over 100 years ago by Hyman Moscot, who sold ready-made eyeglasses from a pushcart on Orchard Street in Manhattan’s famed Lower East Side. Since then, it has grown into a world-renowned brand, made famous by its iconic eyewear. With stores in New York, South Korea, Tokyo and London, and recognised globally as a fashion brand, moving into it’s fifth generation, MOSCOT remains, at heart, a neighbourhood optical shop. MOSCOT have made Ashley a custom pair of Lemtosh sunglasses with Grey Polarized lens. These will accompany Ashley on his month long journey around Europe… it goes without saying that we are all a little bit jealous but wish him all the luck in the world and to enjoy every moment!